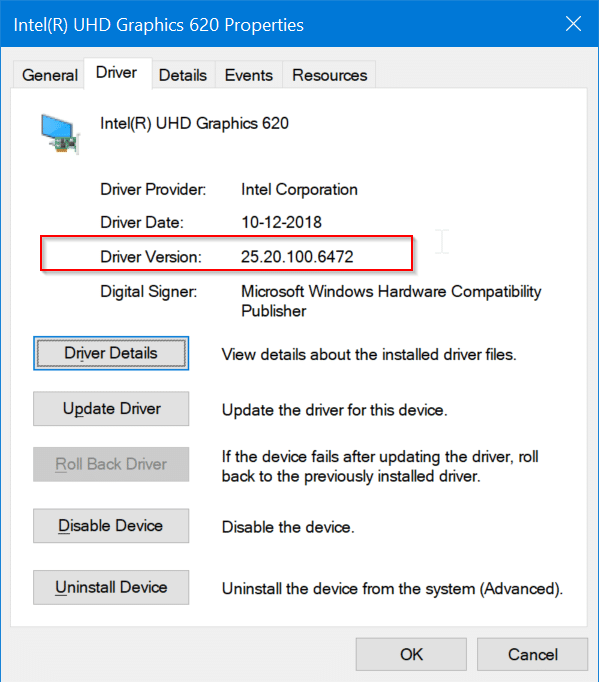 If you have installed a fresh copy of Windows 10 or want to reinstall the graphics driver to address display issues, you might want to download the latest version of Intel graphics driver for your Windows 10 installation. In this guide, we will see how to download the latest version of Intel HD graphics and Intel graphics drivers for Windows 10. 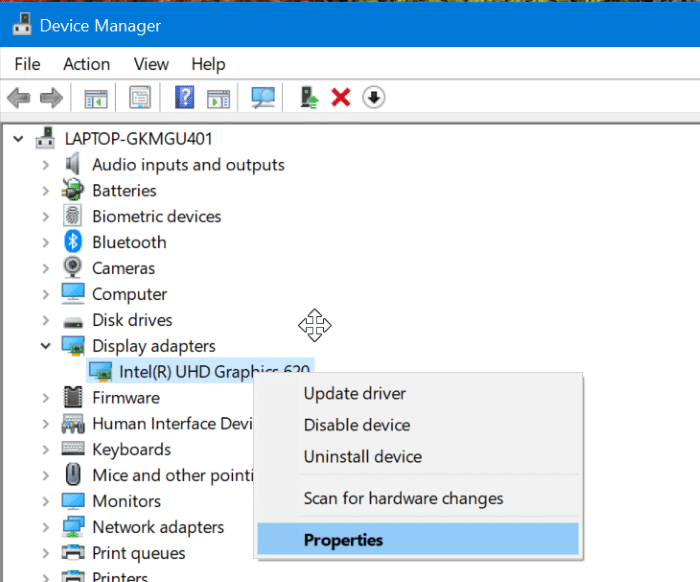 What’s the latest version of Intel graphics driver for Windows 10? 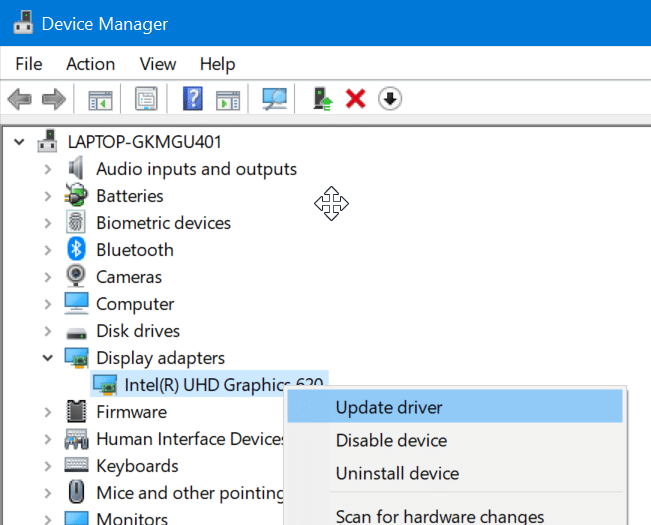 25.20.100.6618 is the latest version of Intel graphics driver out there for Windows 10. This driver is compatible with Intel 6th, 7th, 8th, and 9th generation processors. For 4th and 5th gen processors, 15.40.42.5063 is the latest version of the graphics driver. And if you have the 3rd generation processor, 15.33.47.5059 is the latest version. If you are unsure about your Intel processor’s generation, you can refer to ou­­r how to check what generation of Intel processor you have on your PC guide. How to check Intel graphics driver version installed on your PC? Step 1: Right-click on the Start button on the taskbar and then click Device Manager option to open the same. Step 2: Expand the Display adapters category to see your Intel graphics entry. Right-click on the entry and then click Properties. Step 3: Under the Driver tab, you can see the version number of Intel graphics driver currently installed on your PC. How to download Intel graphics driver? If your PC is powered by 6th, 7th, 8th or 9th generation Intel processor, you can get the latest version of Intel graphics driver for Windows 10 from the following link. Note that Microsoft has moved to a new Universal Drivers architecture starting with Windows 10 version 1809 (October 2018 Update). Because of this shift, Intel is now offering DCH version of graphics driver for 6th and later generation of processors. You can now more about DCH graphics driver by visiting this Intel page. Once again, refer to our how to check what generation your Intel processor belongs to guide for easy directions. If your PC is equipped with the 2nd generation processor, there is no official Intel graphics driver for Windows 10. That said, the driver version supporting Windows 7 and Windows 8/8.1 seems to be compatible with Windows 10 as well. 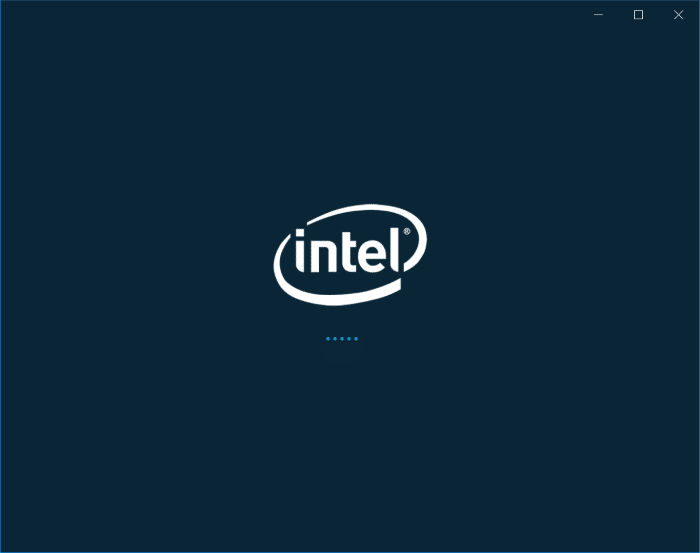 Intel Driver & Support Assistant is a free app for Windows 10 from Intel to download and update drivers. The utility helps you get the correct graphics driver for your Intel graphics. After downloading and running the tool, it will display the available software update for your Intel product on your web browser. How to update Intel graphics driver to the latest version? Windows 10 automatically downloads and installs the latest version of Intel graphics driver. However, if you have turned off automatic driver updates, you need to update the Intel graphics driver to the latest version manually. Here is how to do that. Step 1: Open the Device Manager by right-clicking on the Start and then clicking the Device Manager option. Step 2: In the Device Manager, expand the Display adapters tree to see the Intel graphics entry. Right-click on it and then click Update driver option. This action will open the Update Drivers wizard. 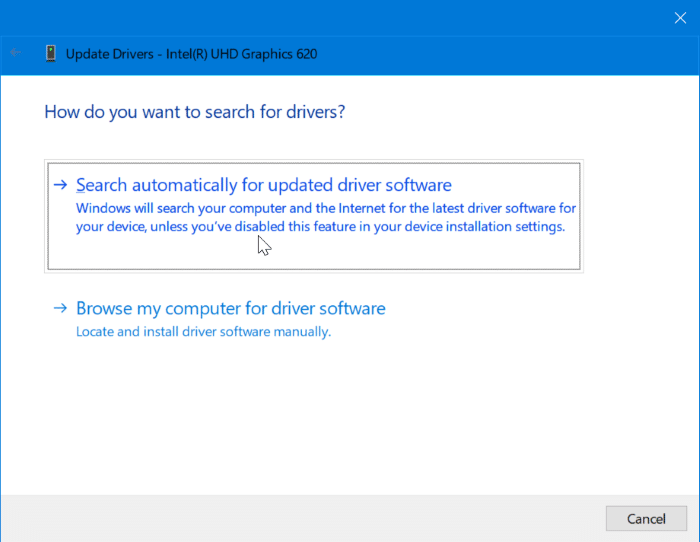 Step 3: Click the Search automatically for updated driver software option to download and install the latest version of Intel graphics driver, if available.